I have been working with some fantastic students from Durham Sixth Form Centre at Durham Miners Association at Redhills. I was lucky to meet some of the students during the run up to the Durham Miners Gala which coincided with the first official visit of Donald Trump to the UK. As part of the People, Pits and Politics festival and together with Peoples Assembly NE, we organised a flag & placard making workshop 13th July 2018 to protest at Trump’s visit. The workshop aimed to encourage young people to come along and find out how to organise a demonstration and make some placards to take along to the Stand Up To Trump block at the annual Durham Miners Gala for the day after. Students from Durham Sixth Form Centre studying A Level Art came along and created some amazing, colourful placards using screen printing, painting, stencils and collage. The session concluded with a practice ‘take over the street’ in Durham city. Its great to be working with some of the same students again and meet some new students from DSFC at Redhills. On October 5th, with funding support from The OTHER Great Exhibition of the North, students had the opportunity to come to Redhills, also known as the Pitmans Parliament to hear first hand from Nick Malyan about the history of the building and the people who built it. The afternoon allowed students to explore the social heritage captuing aspects of the building directly by creating rubbings. Text and mottoes were recreated using traditional wooden type. Students screen printed rolls of paper to use at The Big Draw event that captured the decorative forms in the building. 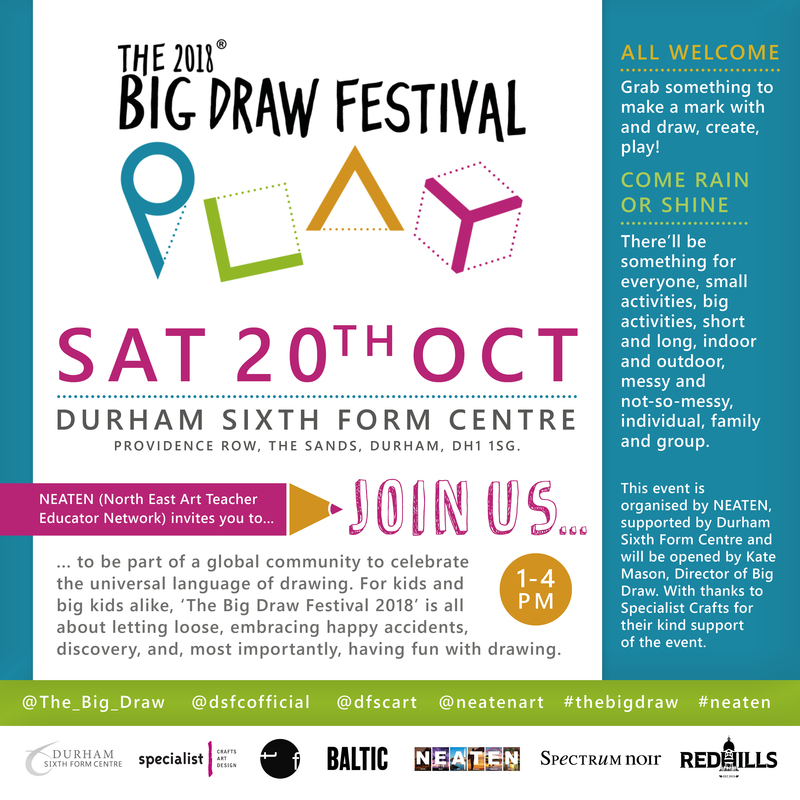 This years Big Draw is a partnership with the North East Art Teacher and Educator Network, at Durham Sixth Form Centre taking place Saturday 20th October 1-4pm. This free event is part of the worlds largest drawing festival and takes place throughout October across the world. There will be a range of artists, illustrators and gallery representatives who will be delivering an array of workshops including letterpress prints, drawing robots, messy play and illustration. Artwork from each workshop will be displayed in the Visual Arts Centre’s exhibition space as part of an evolving exhibition throughout the day.